Less than a mile inland, the breezes are cool, even on hot days when sites further inland are cooking. Charmlee is a beautiful park on a bluff that overlooks the Malibu coastline. If the location alone isn’t enough reason to visit, its trails wind through several different kinds of environments. 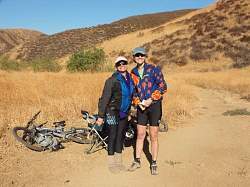 Grasslands give way to chaparral which transcends to oak groves. 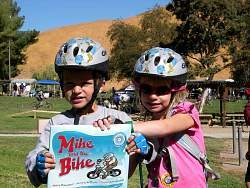 It’s a perfect area for novice trail riders and families. 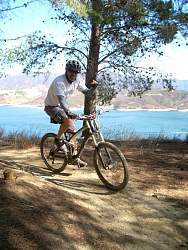 Most of the trails are wide, well-used and easy to ride, though there are a few that can provide a little challenge to the new rider. Most are not steep or technical, and the hills can be easily avoided if you don’t want to raise your heart rate too much. There are plenty of trees for shade and rest, and rocky outcroppings near the trails to sit and have lunch while taking in the view. Since it is less than a mile inland, the breezes are cool, even on hot days when sites further inland are cooking. 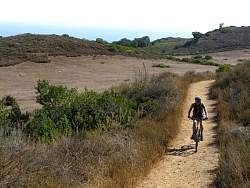 The park is located on Encinal Canyon Road, about four miles from Pacific Coast Highway. There is plenty of available parking which costs $4 per car. Be sure to bring the correct change for the “iron ranger”. There are maps, shaded picnic tables, and a Nature Center that is open on the weekends. 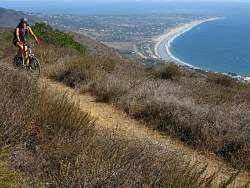 For maps and detailed trail descriptions, go to: Charmlee Natural Area in Malibu at VenturaCountyTrails.org. 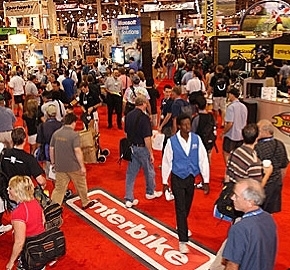 The Interbike industry show is always a sensory overload of all things bicycle, and this year was no exception. There was so much to see and do, plus some celebrity spotting, all while trying to ignore the glitter and allure of Las Vegas. 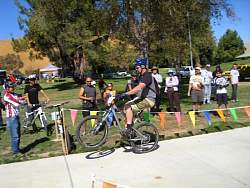 Before the actual conference and exhibit opens its doors, there are two days of Dirt Demo at the Bootleg Canyon Park. All of the manufacturers are there to show off their new bikes and provide the unique opportunity to try them out. 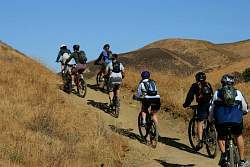 The mountain bikes can be ridden on a stacked loop cross-country course and a downhill specific shuttle run. A very cool element was that the information and aid stations scattered across the course were staffed by the Southern Utah Mountain Bike Patrol, an IMBA National Mountain Bike Patrol club that’s very similar to the Santa Monica Mountains MBU. Interbike pays their expenses to attend and provides some special benefits for this patrol, which has been serving the Dirt Demo for a long time. The show itself provides the bike lover with eye candy of all types. It was clear this year that the industry is betting on a boom in city and commuter bikes. They were everywhere, and the styles ranged from retro to the space-age Jetsons. The recent high price of gasoline has stimulated the city bike market, and the industry is pulling out all the stops to promote the economy, efficiency and lifestyle benefits of short trip city riding. Bikes Belong was there touting their recent project to provide thousands of free rides during the Republican and Democrat National Convention. 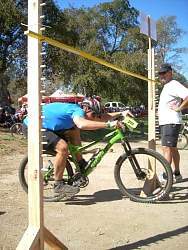 The new SoCal High School Mountain Bike Racing League shared a booth with their Nor Cal Founders. On the mountain bike advocacy front, Philip Keyes, the Executive Director of the New England Mountain Bike association was inducted into the Mountain Bike Hall of Fame. NEMBA was founded just after CORBA and they have grown from a local Boston Save the Trails club to a multi-state confederation that even purchases and manages land for mountain biking. It was a well deserved honor for a great leader. IMBA hosted an industry breakfast showing off its Ride Center program. It also featured an inspiring video about new mountain bike trails in Highbridge Park located in New York City. 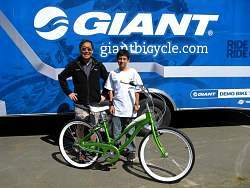 It’s an exciting time for those of us who love bicycling. 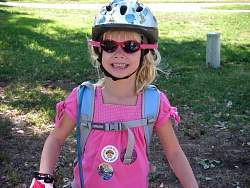 There were advocates from all over the country and a variety of formal and informal meetings provided the opportunity to strengthen bicycle advocacy efforts. CORBA will keep you posted. One of the areas that can spell trouble while mountain biking is going around turns. It should be simple enough, but there are lots of things going on at once. Here are some basic rules to follow to get you safely through, whether it’s a fast fire road or a tight singletrack turn. Whether seated or off the saddle, keep your upper body low and your arms bent. Look at the inside of the turn as you approach, not just at your front tire. The “look where you want to go and not where you don’t” saying really applies here. If you focus on the outside of the turn, you are going to move toward it. To help, try looking as far ahead as you can to see if someone is coming up the trail. Whenever you need to slow down for a turn, try to do so as you approach the turn, then ride through the apex and exit without the brakes applied. 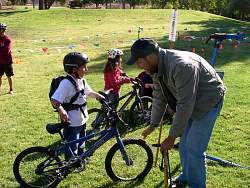 Whenever your brakes are applied, your bike wants to move to an upright position. This explains why it is more difficult for your bike to turn when cornering. If you must use your brake during a turn, keep your body low and look into the inside of the turn. If the trail has normal banking, let the bike lean naturally as you are turning. 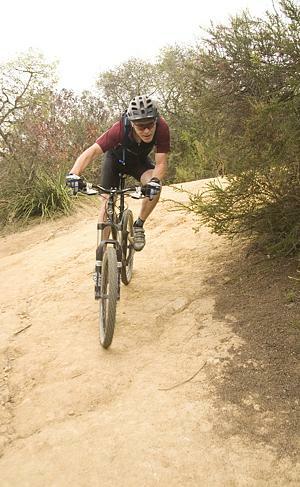 If the turn is off-camber (meaning the inside of the turn is higher than the outside) lean your body toward the inside of the turn, and push the bike into a more upright position. Try to get your head over your inside hand (see photo). If the front tire starts to slide, keep your body low and inside, it will help the tire to regain traction. Do not apply the brakes if the front tire starts to slide. If the turn is smooth, it’s always more efficient to be seated with the inside foot at 12 o’clock and the outside foot at six o’clock. Push down on the outside foot and point your inside knee into the turn for better balance and improved center of gravity. 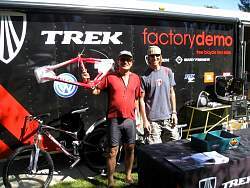 The 2008 Fat Tire Fest – the People Who Make It Happen! We would like to thank all of our volunteers, sponsors, exhibitors and product donors for their participation in October's Fat Tire Fest. by Benjamin Griffes, M.A., D.C.
Muscles are meant to move. The advancements of modern society have made our lives both more efficient and stressful. While modern man can communicate and travel great distances, today’s methods require very little movement on the part of each traveler. Repetitive immobility, replicated on a daily basis, leads to chronic, postural overload and adaptive shortening of the muscles and fascia (connective tissue). This shortening of the myofascia exhibits itself as stiff joints, decreased flexibility, loss of fluidity, and poor posture. When you continually stress and tighten a muscle group, the fascia and muscles will adhere together, restricting their range of motion and creating postural imbalances. You might think of yourself as balanced, but often times it is because you are so contracted, all you have created is chronic rigidity and nothing in your body moves without tightness or stiffness. The goal of any athlete, then, is to look for ways to correct musculoskeletal restrictions and to embrace those strategies which will help the body regain balance and reduce this chronic rigidity. Research has found that people who stretch daily have a lower risk of injury when engaged in athletic activity than those who only stretch prior to the activity. One major strategy that can truly help is a daily stretching program. Research has found that people who stretch daily have a lower risk of injury when engaged in athletic activity than those who only stretch prior to the activity. Stretching should become a habit, done regularly, just like brushing your teeth. Without stretching, you continue to promote a pattern of restricted movement and muscle fatigue. One physiology textbook points out that muscle fatigue comes from a prolonged and strong contraction of a muscle. It is the interruption of blood flow, due to contracting muscle tissue, which leads to muscle fatigue, resulting in the loss of the nutrient supply and the lack of oxygen. Fortunately, a stretching program does not require a lot of time, so can fit into almost anyone’s daily routine. Your program can be successful if it is done consistently and with purpose. Most muscles only need 20 to 30 seconds to begin releasing tension, but up to one minute is recommended. You should have a set of basic stretches for your spine which include movement of all directions; flexion and extension, rotation, and lateral flexion. These back stretches should be done daily. Some people use the stretches to help wake up in the morning while others prefer to stretch at night. Anytime is acceptable as long you do the stretches slowly and gently. Just bear in mind that warmed up muscles are going to stretch more easily. Sidebends – standing or sitting, bend to the side with your arm over your head. Hold for 30 seconds each side. Rotations – lying on the floor, bend your knees and drop your legs to the left, resting them on the floor. You should feel a stretch along the right side of your back. Hold 30 to 60 seconds. Repeat on the other side. Cat/Cow – on your hands and knees, arch your back up (like an angry cat) while tucking your chin to your chest, then drop your back (sag like an old cow) and bring your head up. This is done in an easy, fluid motion, breathing the whole time. Do this six to eight times. Do the Lunge Stretch often throughout the day, whenever you have been sitting a lot. This will help prevent tight hip flexors, which can contribute to poor posture. Stand up, place the right leg behind you as far as you can, placing your weight on the toes (not the heel). Bend the left knee, keeping your body erect. You should feel a stretch in the groin area at the top of your thigh. Hold for 30 seconds. Repeat with the left leg. Try and avoid any forward bending when you first wake up in the morning and after long periods of sitting. Warm up your back first before bending forward. Quadriceps: Stand on your left leg, bend your right knee and grasp your ankle, gently pulling your leg back until you feel a stretch along the front of your thigh. Hold for 20 – 30 seconds, then repeat with your left leg. Hamstrings: Standing next to a chair, desk, or table, place the heel of your right foot on the surface and stand up straight. Slowly lean forward, reaching for your toes. You should feel the stretch along the back of your thigh. Breathe. Hold the stretch for 20 – 30 seconds, then repeat with the left leg. Hip/piriformis stretch: Sit up straight in your chair, crossing the right ankle on to the left knee. Slowly lean forward, keeping your back as straight as possible. You should feel a stretch in the right hip/buttock/thigh. Hold for 20 – 30 seconds, then repeat with the left leg. Desk shoulder stretch: Standing with your feet wider than your hips, bend forward at the waist and place your hands on a desk or table. Straighten your arms and let your back gently relax. You will feel a stretch in your upper arms, shoulders, and along your back – wherever there is tightness. Breathe. Hold for 20 – 30 seconds. Special offer to all cyclists. Stretching for Life will donate 20% of your purchase to CORBA. Simply mention CORBA with your order. For more information, visit www.stretching4life.com. Dr. Griffes is a Chiropractor practicing in both Tarzana and Thousand Oaks. He is the author and developer of Stretching for Life Products. Visit his website at www.stretching4life.com to view his book, DVD on back exercises, and his CD for stretching while at your computer. You may also reach him at (818)708.0740 or (805)358.8572. 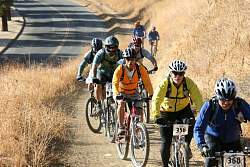 SoCal Interscholastic Cycling League – Team and Coach Registration Open! In November, Mark Langton and I attended the SoCal Interscholastic Cycling League's benefit dinner with Master of Ceremonies, Gary Fisher. CORBA is a sponsor of the League, recently making a donation of $500. 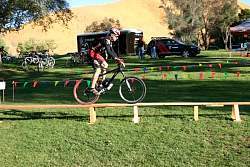 The SoCal League will provide a complete mountain bike riding and racing program for all interested public and private hish school teams and indi viduals. 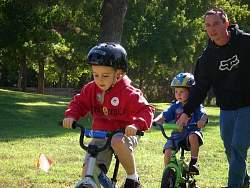 Matt Fritzinger, Executive Director, and his team who formed the highly successful NorCal Cycling League, are forming the league with the addition of Quintin Easton as the President of the SoCal League. 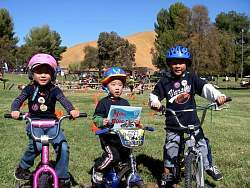 Teams are forming all over Southern California with the first race of the series set for March 8, 2009 at Vail Lake, Temecula. 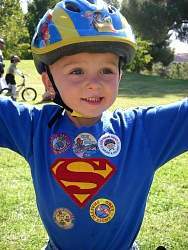 The next set of SoCal Rider Camps is scheduled for February 2009. 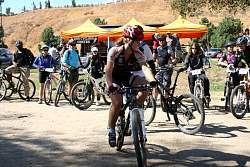 The one-day camps are designed for beginner and intermediate riders who are of high school age and are thinking about trying cross-country nmountain bike racing. Advanced riders also benefit from the camps. 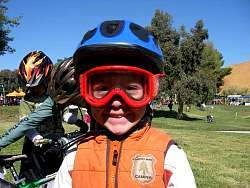 If you are interested in forming a team, coaching or getting invoved in any way, please visit www.socaldirt.org. The CORBA retail program is getting stronger! These retailers have chosen to support CORBA members by offering discounts on products and services. Show your support by supporting them. Check the CORBA Members' Benefits page for regular updates. The message changes every day at 2 p.m. It is illegal to ride in the parks when they are closed due to high fire danger.